A profound meditation on compassion and mercy, Sansho the Bailiff (1954) builds its power through the ethical wisdom of its narrative and the beauty and power of its visual expression. For each of these six entries, there will be a two-pronged focus, first on the ethics of Sansho the Bailiff and second on visual analysis of targeted scenes. There are three scenes in Sansho the Bailiff that can reduce me to tears. Two of them are obvious. Anju’s suicide and Zushiô’s climactic reunion with his mother are widely acknowledged as emotional powerhouses. Zushiô has been appointed governor of the province. 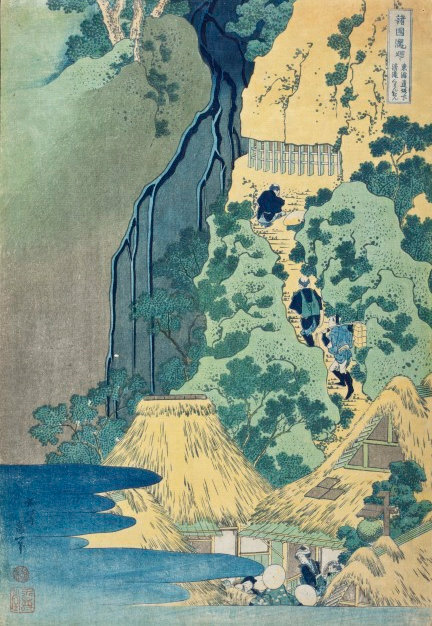 Remarkably self-composed, he asserts himself within Sanshô’s compound, orders Sanshô taken prisoner, and then confidently walks out of the manor to speak to the slaves. His voice breaking with emotion, Zushiô declares that all slaves are now free, with a choice to either leave or remain and work for fair wages. Zushiô pauses, seeing a familiar face: Nio, an old man whom he once branded. in the background, indicating approval. her master watches, indicating approval. Zushiô’s apology refers back to the scene where he branded Nio at the request of Sanshô. The branding was the rock bottom of Zushiô’s character arc. To make it even more appalling, Zushiô’s cruelty is linked to a subsequent scene where his mother Tamaki, living as a courtesan on the far-away island of Sado, is brutally punished by her owner by having her Achilles tendon cut to prevent her from further attempts at escape. 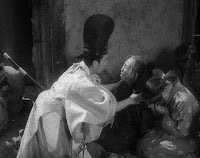 In a movie where family relations are paramount, Zushiô’s act is doubly condemned by its association with a horrifying punishment exacted against his mother. From this low point, the story documents the redemption of Zushiô, fueled largely by the self-sacrificing act of his sister Anju. The personal encounter is necessary. Zushiô, the offender, must accept responsibility and ask for remorse from Nio, the aggrieved. The scene is even more moving for its stress on the difference in social status between the two. The governor kneels and begs forgiveness of the slave. Then Zushiô stands and asks what has become of his sister. As he learns the tragic news of Anju’s death, he realizes that his redemption is not yet complete. The emotionally-wrenching apology is only one step along the hard road that he must follow. Zushio visits the lake where his sister took her life. 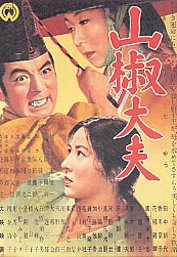 In interviews, director Kenji Mizoguchi promoted his cinematic vision of one-shot/one-scene. He asserted that a moving camera should be able to capture all necessary details and build the appropriate emotional climate from the beginning to the end of a scene. No cutting between shots should be necessary. In film language, this approach privileges mise-en-scène (design and arrangement within the frame) over montage (editing from one shot to the next). In practice, Mizoguchi rarely held to the ideal that he preached. While the key scenes in his movies take strong advantage of crane shots, tracks, pans, and tilts, he nevertheless usually cuts to individual shots. 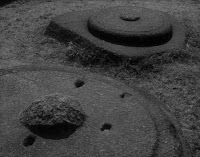 And the scenes are typically more powerful for his intelligent, though limited, use of montage. 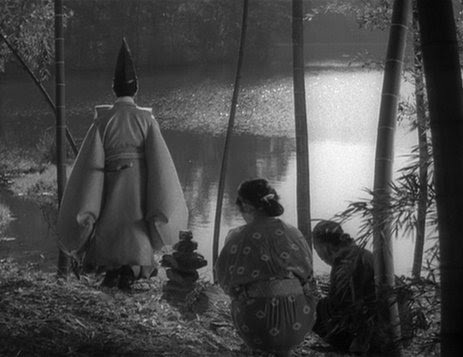 The forgiveness scene in Sansho the Bailiff approaches his one-shot/one-scene ideal. 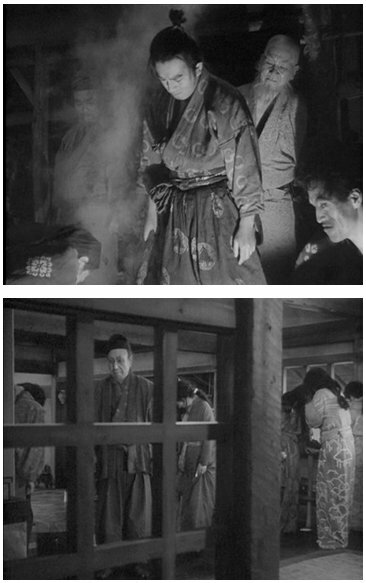 Starting at the moment when Zushiô sweeps out of Sanshô’s manor, the scene consists of only two shots. The one cut comes in the middle and is so smoothly handled that the scene could easily be recalled as a single take. The scene begins with an overhead exterior shot of Zushiô grandly exiting Sanshô’s manor and walking down the steps into a crowd of slaves. Zushiô’s bright ceremonial clothes brilliantly contrast with the drab and ragged clothing of the slaves. As he moves toward the camera, the camera keeps Zushiô centered in the action while slowly craning lower to finally settle into an eye-level perspective. This visual approach establishes Zushiô’s political control over the situation, even as he delivers his speech with evident emotion. He dominates the shot, establishing him as a formidable figure—to a much greater degree than Sanshô has ever been privileged in a shot. The old slave Nio, the brand on his forehead fully visible. Zushiô’s perspective, looking down upon Nio, the old slave he once branded on the forehead. As Zushiô kneels, he re-enters the frame. For their brief dialogue, Zushiô is filmed from behind (echoing the earlier scene where he humbly listened to his father’s teachings). Seen in closeup, Nio becomes the focus of the viewer’s attention. Their shared humanity is emphasized, both through the visual composition and Zushiô’s public apology. When Zushiô stands, the camera rises with him (via a tracking crane movement), following him as he retraces his steps back through the crowd. As he approaches a group of women, the camera moves ahead of Zushiô to create a new composition. Instead of the primary focus upon Zushiô, he now shares the frame with Kayano, who shares the news of Anju’s death. It’s intimidating to consider the directorial mastery necessary to organize a remarkable scene like this. Each of the three actors deliver performances that sear into the memory. Two of these actors are separated by a considerable distance, only united by the movement of the camera. Linking the movement and serving as the center of the narrative, the actor Yoshiaki Hanayagi who plays Zushiô must convey a strength of character that the viewer has not previously seen in his character. He pulls it off beautifully. 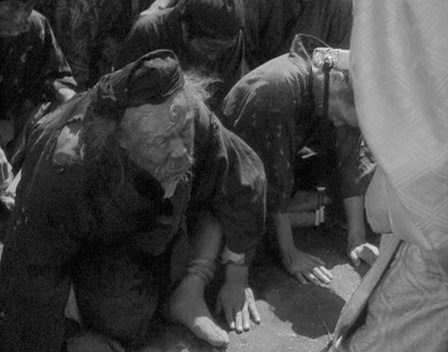 Meanwhile, Mizoguchi must direct and choreograph the unruly crowd, keeping their actions believable. The moving camera must capture Zushiô’s power and status as governor and then just as effectively convey moments of intimate confession. In over a century of filmmaking spread across hundreds of countries, only a few dozen directors have shown a comparable mastery. This one scene is like a film school in miniature.